A cast copper-alloy harness or belt mount dating to the late second or early third century AD. The fitting is circular in shape and openwork, comprising four tendrils, which meet to form a cross and create four openwork pelta motifs. The openwork plate is D-shaped in section. On the underside of the openwork plate, positioned on the circumference of the fitting, there extend two circular-section lugs, with applied flat circular end-plates. The mount measures 25mm in diameter and a maximum of 2mm in thickness. The lugs measures 5mm in length and are 3mm in diameter. The end plates are 6mm and 7mm in diameter respectively. It weighs 6g. 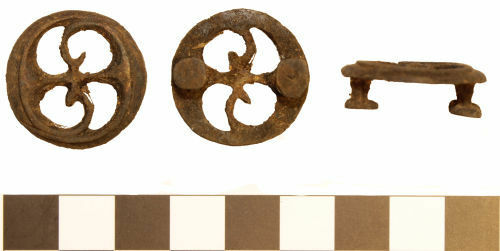 A similar, but slightly more elaborate circular mount (BM-7607F1) has been found in the River Tees at Piercebridge and forms part of the same assemblage.